This day. It was circled on the calendar and etched on your heart. It was the day you hoped to meet your baby—to hold her, to study him. You planned to take her to your breast. You anticipated smothering his toes with kisses. You had begun to rearrange your life around this day. It was to be a “before and after” day, marking a huge and happy transition in your life and home. You had planned to organize your work around this day. You had counted months before and after this day as you imagined your crawler at Christmas or your newborn as you took your oldest to school for the first time. This was the day you were to post the face of your little one on instagram and watch the congratulations pour in as the world was introduced to this piece of your heart you had already known and loved for nine long months. And yet now this day has come and you are left with nothing to show but a broken heart. Friend, it’s not fair that your baby isn’t here. A mother should never have to face a due date without a baby in her arms. You and I both know there are lots of reasons why a baby and mother aren’t together on this sacred day, but today those reasons don’t matter. They are crowded out by the one simple fact that your baby’s not here. 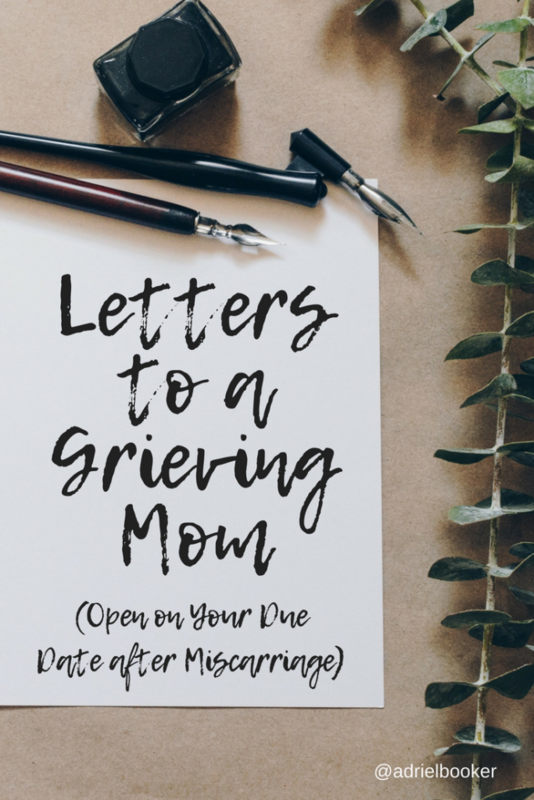 As you take time to think about how your heart feels and where your soul is in the grieving process, give yourself permission to feel the sadness, the injustice, the heartache. Have you wanted to cry but couldn’t find the tears? Watch a sad movie and let it help you tap in. Have you been fine looking at other people’s babies on facebook but now the sight feels like a punch in the gut? Go ahead and hide that friend from your feed for a little while. I want to be able to tell you this day will get better as the years go on. And for me it has. 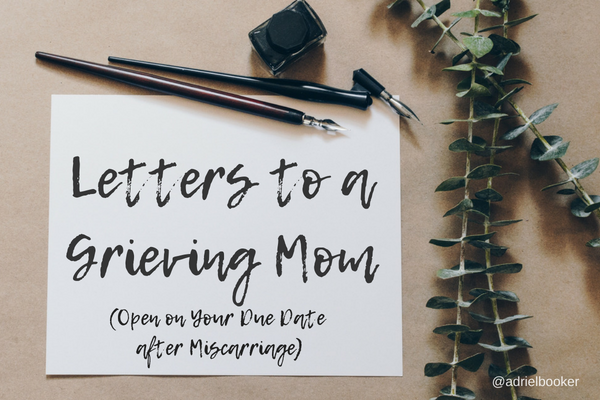 Due dates are now a time of thoughtful reflection for me—days where I practice gratitude for how God’s carried me, more so than reminders of how much I’ve lost. But I won’t make promises to you that can’t be kept. I don’t know how you’ll feel on this day during years to come. Time does not heal all wounds, but Jesus does. Jesus will. We can grieve with hope. So whether today has thrust you back into sorrow, has caused you to feel lonely, has brought you to your knees in surrender, to your feet in anger, or filled your mind with doubts and questions please know this: God is not intimidated by any of it. He can handle it all. Your humanity isn’t a burden to him; it’s a gift that keeps you tethered to him. God is with you. He is present. He can keep you in his peace. You and I—we have different grief journeys, but I feel confident telling you this: When you feel pulled back into grief it doesn’t mean you are going backwards. Grief is like a spiral—you can spiral up or spiral down. Just when we think life is feeling a little more normal, it can sneak up and hit us like a heat wave. And you may feel it today in great measure. Or you may not. Either way, know this: you cancontinue to grow forward. Maybe since you saw today coming you feel ready. You’ve talked to a loved one you trust, arranged a quiet moment in your day to pay tribute, or spent time journaling your collapsed hopes. Perhaps you’ve entered into prayer or have drawn aside to meditate on God’s promises to never leave or forsake you. But if you haven’t, know it’s not too late. Take some time now and listen to your own heart—what is it trying to tell you? And then take some time to listen to his—ask God to draw near. In the sermon on the mount Jesus said, “Blessed are those who mourn, for they will be comforted” (Matt 5:4 NRSV). Friend, we are not blessed because we mourn—that’s not the blessing. We are blessed because in our mourning we can experience God’s comfort. So may you feel the warm embrace of his comfort today. May you know God’s blessing in the midst of your pain.